How many businesses do you know that are 200 years old and still running? It’s not a long list. Laphroaig celebrates it’s 200th anniversary this year with this special bottling. Survival in the whisky industry requires long term thinking. Distillers must always think about what will be happening 10-15 years down the line when their products hit the market. It looks like Laphraoig has done just that as this year’s special “friendship” bottling contains 11-12 year old whisky that was produce as close to the old Laphroaig way as possible. All the malt came from their own maltings and only the 2 smallest stills were used for distillation. It’s as Laphroaig as Laphroaig can get. If you’ve ever been to Laphroaig and taken a tour then you’ll know that their malting floor is not that large (by today’s standards) so it stands to reason that they were probably not able to make much of this stuff. This suspicion is somewhat backed by their move to use a ballot system for online sales of their 2015 Cairdeas bottling. At present there seems to be only 2 ways of getting a bottle of this: go to Laphroaig right now or be a “Friend of Laphroaig” and then enter a raffle for the chance to purchase online (click here for more info on that). I was lucky enough to try this expression at a tasting held by Moxie (former VP of Heriot-Watt whisky society and salesperson at RMW) at which he indulged us with some of his spoils of war attained on Islay during Feis Ile 2015. Refreshing fruit with solid peat at the front. Kind of minty, vegetal, slight peanuty, green grapes, and lingonberries. Bit plasticy. Sweet herbal notes. Ferns and it makes me think green for some reason. Kind of refreshing like an Irish Springs soap bar. Peaty but not very strong. Even though this is bottled at a hefty 51.5% it does not taste like it. I would have thought it were more in the area of 46%. It comes off as being light and a bit oily. Nice and long gentle sweetness with easy peat. Sweet like herbal tea. I really liked this one. It’s not necessarily what I think of when I think Laphroaig. It definitely has that Laphroaig character but somewhat softer and maybe more refined than some of their current expressions. While the quarter cask, 10, and 18 strike me as being heavy and perplexing this one is more crisp and bright. I kept thinking refreshing. Like something I would drink in the heat of summer sitting on the porch of a southern home. Something like that. 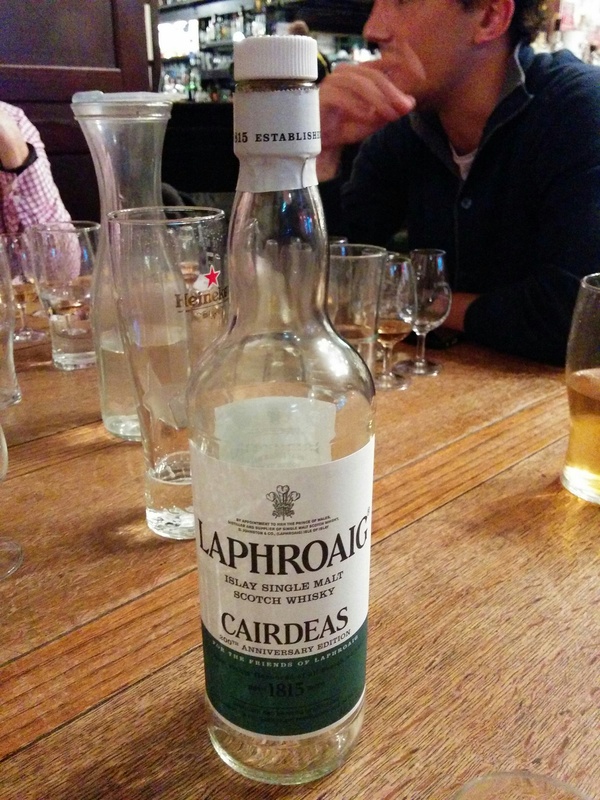 It’s definitely neat to think that this might be what Laphroaig tasted like two centuries ago. At £65 retail, this is definitely worth it.